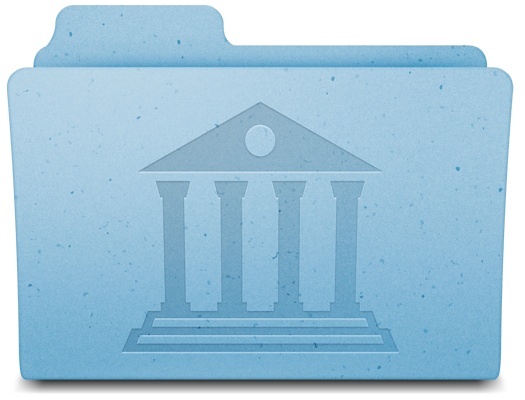 All of the latest versions of OS X have opted for a conservative approach to showing the users ~/Library/ directory, a folder which contains a variety of important files, settings, preferences, caches, and many specific files that are required for apps to run as intended. 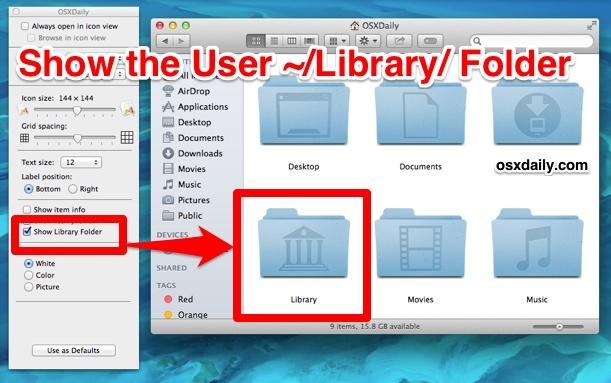 Because of the possibility of unintentional harm to a users Mac, OS X defaults to hiding that folder, with the intention on preventing novice users from making changes to it. OS X Mavericks is no different, but with the release of 10.9, all Mac users have an easy option to permanently show the User Library directory without having to result to the command line or other tricks that were previously required for access to the ~/Library folder. This setting is permanent as long as the checkbox is active, it does not need to be toggled again repeatedly throughout OS X updates. If you decide you no longer want the ~/Library/ folder visible, simply uncheck the box in the Home directories ‘View Options’ panel to make it invisible again. Note that for multi-user Macs, this setting must be toggled separately on each user account. This is a greatly helpful trick, though it’s usage is slightly more advanced than some of the more simple Mavericks tips we have covered. There are still a variety of other ways to jump to the ~/Library folder for quick access, all of which continue to work in OS X Mavericks. Again, the chflags approach is no longer necessary for Mavericks, though it still does work. For the vast majority of Mac users, simply toggle the setting to your liking in View Options, or use one of the temporary access approaches. I upgraded to Mavericks yesterday. My thousands of important emails have disappeared, all my inboxes are empty. I see them all on my backups on Time Machine but can’t seem to be able to import them. Do you have any suggestion please? I am pretty sure the method you describe no longer works with Mavericks, but in any case, there is a simpler way of doing this. Get to the desktop and click to insure it’s active. 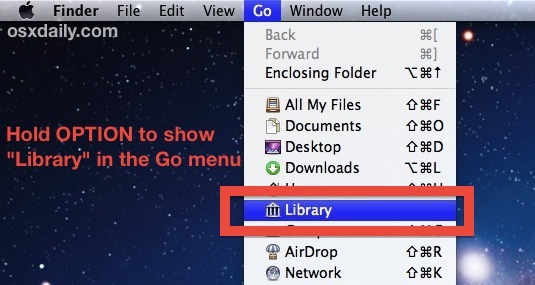 Select the ‘Go’ menu while clicking the option button. The Library option for the Finder will be listed and one just needs to click it to make it active. Yes, the Show Library option is ALWAYS in the “View Options” window in OS X 10.9.5, you need to be in your HOME folder to be able to see the Show Library option in View Options window. It’s your User Library, thus you need to be in the User Home folder. It will work for you, this is universal to OS X, follow the instructions. I tried to change the name of the primary user folder due to a change in staff here at work. Now all of the original preferences are gone and I have multiple user folders. How do I rename the primary user folder (home) and bring back the preferences of another user. I need to see the user library on my backups made before I made it visible. This is not working. I, too, have lost folders in Local Folders in Thunderbird after a system restore. I was hoping I could restore an older version, but the folder with the data is hidden on the backups and I can’t get at it. Shouldn’t there be a way to do this from Terminal? I am latest Mavericks and the show library option in view menu is not there even though I have user folder selected. You HAVE to be in the home folder, derpettes. CMD+SHIFT+H in Finder, as it said in the article. Worked fine. Thanks for the write-up. I am using OS 10.9.5, and I’m absolutely on my home folder, and there is no “Show Library” option. I even right clicked on my home folder and selected “Show View Options” from the resulting menu, and “Show Library” is NOT one of the view options. If you use this command [⌘ + Shift + .] you can reveal all hidden files. Unless your exact wish is to show only the Library directory.